The 3D chess set is looking quite good, modeled by my friend Gaetan Loyer. It doesn’t know anything about openings or endings. But it will probably still kick your a**. This entry was posted on Monday, October 22nd, 2007 at 3:04 pm	and is filed under Samples, User Applications. You can follow any responses to this entry through the RSS 2.0 feed. You can leave a response, or trackback from your own site. Superior workout, the IDE and the philosophy I was looking forward for long time. I could not find an undo. I could not run the chess demo that I built from source code. 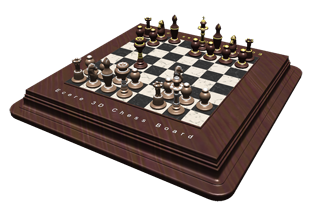 What particular problems were you having with the Chess demo, and what machine / platform are you on? If you have IRC please come to #ecere on irc.freenode.net for support, or you can also register and post in the developers’ forum.